Many people decide to go on a gluten-free diet for various reasons. These may be either experimental, because they have read that this diet can help their IBS, or because it was suggested by a healthcare practitioner. In many cases these people are only reacting to wheat and not gluten. Removing nutritious foods from the diet presents a number of problems, can lead to nutritional deficiencies, and is not good for one’s social life. It is not always easy to know which foods to substitute with, especially when eating out. A coeliac test would determine whether there is in fact a gluten intolerance. Gluten is present in the grains oats, barley, wheat, rye and spelt and oats actually contain more gluten than wheat. Many people with IBS have no problem with oats, as oats contain soluble fibre and is mucilaginous, meaning having a soothing and protective effect. Wheat, on the other hand, contains insoluble fibre in the bran and is rough on the intestines. It is high in phytates which remove valuable minerals from the food being digested. Wheat also contains a large amount of an amino acid, proline, which is difficult to digest. Wheat bran, which is the outer husk, unlike the germ, does not contain any nutrients and is not necessary to include in the diet although it is is lauded as the cure for constipation. Green vegetables contain sufficient fibre to keep the bowels regular and should be included in the diet each day. The old-fashioned method of raising bread took 30 hours or more, involving two shifts of workers, and this fermentation process broke down most of the gluten. These days, bread is leavened for 3 hours or less, retaining most of the gluten present. This practice was employed by the large corporate bakeries who wanted to save on labour costs and provide a less expensive loaf. There are bakeries which still employ the long leavening process, enabling consumers to still enjoy their bread. 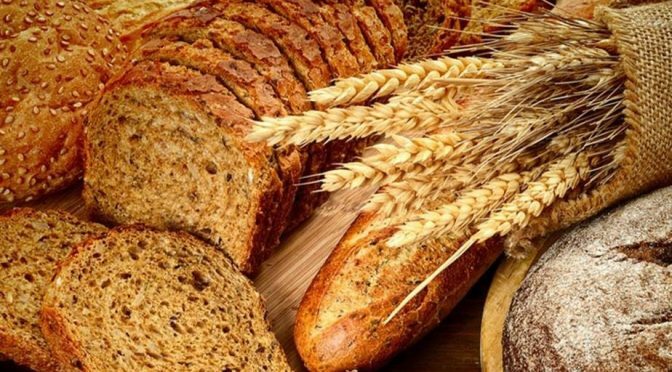 Unless someone has been diagnosed to be coeliac, it is questionable as to whether that person need be on a strict gluten-free diet. Symptoms such as bloating, cramping and abdominal discomfort can be the result of a food intolerance requiring an IgG test. These tests can be arranged by your naturopath at View to Health to determine which foods you are having a strong reaction towards. Another way of determining which foods are causing a reaction is to remove a group of suspected foods from the diet for up to 2 weeks and then re-introduce them. Often the food causing the reaction can be rotated every 4 days. However, by improving digestion with a herbal tonic and following a protocol to remove harmful bacteria and recolonise the bowel, these symptoms are usually successfully addressed. Your naturopath at View to Health will design the appropriate diet for you with the necessary supplements and tonics. Try out this recipe for a slow-leavened bread courtesy of Rob Santich.